AMMAN, Jordan, Jul 21 2017 (IPS) - Held for the first time in the Arab world, an annual meeting of Asian and Arab Parliamentarians examined how regional conflicts hinder the development of effective policies to achieve sustainable development, particularly as they generate large numbers of refugees, internally displaced persons and migrants. To reach a comprehensive solution, legislators called for examining the roots and background of conflicts in the region. The meeting kicked off Tuesday, July 18 in the Jordanian capital Amman with a focus on challenges faced by youth, including high unemployment rates and poor access to healthcare, as well as women’s empowerment and other sustainable development issues. 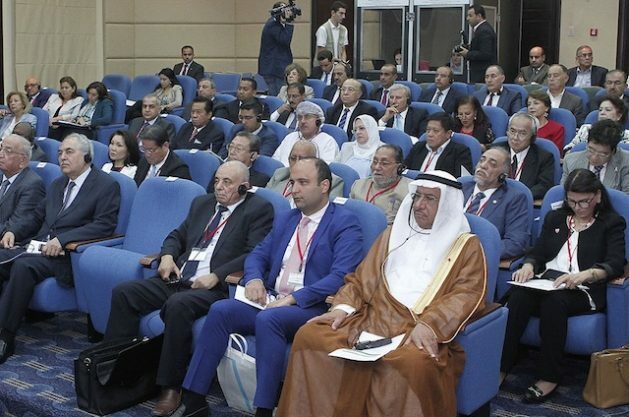 Around 50 legislators and experts from Asian, Arab and European countries attended the meeting, organized annually by the Asian Population and Development Association (APDA) which serves as the Secretariat of Japan’s Parliamentarians Federation for Population (JPFP). This year’s meeting was held under the theme “From Youth Bulge to Demographic Dividend: Toward Regional Development and Achievement of the SDGs” and hosted by the Jordan Senate and Forum of Arab Parliamentarians on Population and Development (FAPPD). On behalf of the conference organizers, Acting Chair of JPFP Ichiro Aisawa addressed the gathering, devoting his remarks to the need to address challenges facing youth in the region, which he described as the birthplace of two of the world’s three major monotheistic religions and which has contributed richly to humankind’s cultural heritage. Aisawa, who is also Director of APDA, called on parliamentarians to work together to realize sustainable development for the good of all. Bakhit stressed that population and development problems in Arab countries are caused mainly by conflicts, wars and forced migration. The first session touched on regional challenges, young refugees and means of fostering social stability. Jordan’s MP Dr. Reda Khawaldeh told IPS that building peaceful and stable societies is a responsibility that must be shouldered by the state, religious leaders, media and other civil society organizations. Picking up on the main theme of Amman meeting – a youth bulge in the region, which describes the increasing proportion of youth relative to other age groups – Aisawa told IPS that frustration is one of the reasons that led angry Arab youth (most of whom were highly educated but with no jobs) to protest in the streets and topple their leaders. These young men had lost their hopes and dreams of having a decent life, he said, stressing at the same time that this phenomenon is not limited to Arab countries, but could happen anywhere. “To address this key dilemma, governments should create societies where people can realize their dreams and achieve their goals. Politicians must also advocate policies based on democracy where the rule of law prevails and people identify themselves as constructive stakeholders who participate in building their country rather than be the source of disruption and chaos,” Aisawa said. The second session discussed the demographic dividend and creating decent jobs for youth. Sharing his experience in this regard, Philippines MP Tomasito Villarin said his country has adopted five local initiatives to give youth quality education essential for enhancing their productivity in the labor market and providing them with decent jobs. Villarin told IPS that to achieve SDGs, his country must also address other grave challenges, including massive poverty in rural areas and an armed conflict south of Manila. Focusing on women’s empowerment in the region as a driving force for sustainable development, Jordan’s MP Dr. Sawsan Majali warned that gender inequality is still a major challenge, especially for women with disabilities. The second day was dedicated to a study visit to a number of sites in the ancient city of Salt, some 30 km northwest of the capital, where participants had the opportunity to explore and share good practices of development projects provided by the Salt Development Corporation (SDC), aimed at supporting community services and raising public awareness. SDC Director Khaldoun Khreisat said financial and technical support came from the Japan International Cooperation Agency (JICA), whose officials saw Salt as a similar model to the Japanese city of Hagi. During the three-day meeting, close consultations were held on other issues, including the key role parliamentarians play in achieving the SDGs, promoting accountability and good governance. In his closing address, Vice Chair of JPFP Hiroyuki Nagahama stressed that politicians are accountable for the outcome of their policies and they have the responsibility and power to build a society where everybody can live in dignity. At the end of meeting, Algerian MP Abdelmajid Tagguiche proposed the establishment of a committee to follow up and implement recommendations and outcomes of the conference. As the curtain came down on July 20, a draft statement was issued calling for examining causes of conflicts in the region to achieve the SDGs, create decent jobs for youth and provide societies with health care and gender equality. APDA was established on Feb. 1, 1982 and since that time it has engaged in activities working towards social development, economic progress, and the enhancement of welfare and peace in the world through studying and researching population and development issues in Asia and elsewhere.